LondonJazz: REVIEW : Lume Presents . 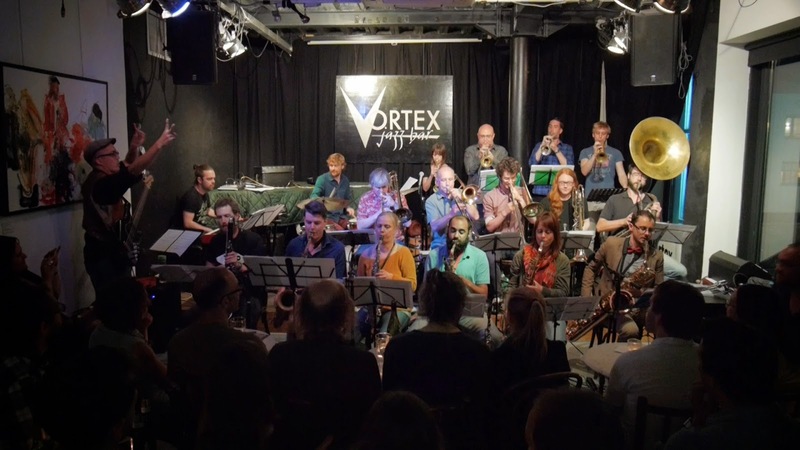 .Madwort’s Menagerie and Overground Collective at the Vortex. REVIEW : Lume Presents . .Madwort’s Menagerie and Overground Collective at the Vortex. LUME is the brainchild of two saxophonists who are making their names in the free jazz and improvisation circuits, Cath Roberts and Dee Byrne. They have been organising weekly performances that focus on improvisation and original music under the LUME banner since July and have recently been awarded the PRSF Jazz Promoters Award. The Vortex has shown exceptional foresight in offering LUME this monthly opportunity on the first Sunday of every month until the end of 2014, not only for the reason that Roberts and Byrne are informed and careful curators, but also because they have a real knack for audience development and promotion. Their first LUME Presents … At the Vortex sold 21 advance tickets and turnout totalled 82 people, many of whom had to compromise British standards of personal space at the back of the room. It was difficult not to come in with very high expectations. The Overground Collective is essentially a 19-piece big band of outstanding soloists and improvisers. Its founder, Paulo Duarte, is a Portuguese composer and guitarist who has been in London since 2003. This performance preceded the Collective’s first recording together and was the first outing of several of Duarte’s new compositions. The balance of instrumentation allowed both great intimacy and enormous energy, often creating an exhilarating wall of sound. Duarte’s ability to write music that is at once melodic and accessible but highly challenging and unexpected where the improvised elements hold primacy, is the key to the inevitable success of this music. The performance was intended to be performed as a suite, with no breaks, but this was difficult to execute because of the audience’s need to show its appreciation. This is an element Duarte could consider leaving aside for future performances. Ben Bastin on bass made a gallant conducting effort supported by key members within the band. The complex counting required in this music was evident in the occasionally anxious faces of the performers but none of that anxiety could be heard in the confident, energetic and fully committed execution. Jon Scott (drums), Ben Bastin and Danny Keane (piano) provided an unshakable base which is vital for a score where grooves take sudden U-turns and tension is created with frequent stops and changes. The perfect execution of these was heart-stopping. This is a big band that I would make time to see again and again. Tom Ward, a saxophonist with the Collective, started the evening with his own project, Madwort’s Menagerie, which incorporates woodwind, bass and cello into his previous format of sax quartet. This is the third in a family of Madwort bands, exploring Ward’s compositions through differing instrumentation. Many of his compositions take root in Ward’s fascination with mathematics, creating music by taking a prime decomposition of the date he sits down at the piano to compose. To my ear, what could be heard in his music was both the randomness and the clear thinking and structure of its birth. It was music that was also thrilling in the simplicity of its everyday inspiration and humour, a favourite being Fish Biscuit Standoff, a composition that emerged from an experience trying to get his discerning cat to eat the food it had been served. It sounded like more could emerge over time from the compositions as the musicians spend more time together and as Ward’s communication as bandleader takes hold. It occasionally felt that some of the instruments were underused, perhaps because of being additionally incorporated into existing compositions or simply because it is a new project and an integrated sound takes time. Overall thought-provoking, entertaining with clever instrumentation and the beginning of something utterly unique. The next LUME presents…At The Vortex takes place on Sunday 7th September, featuring Corey Mwamba and Deemer. LUME resumes its weekly programme at the Long White Cloud (151 Hackney Road, E2) on Thursday 4th September.